I was finally able to try a recipe from June's menus! Sigh. It's not like this month's menus are even that intense, but since we're remodeling the kitchen which is where I spend most of my time, it's very hard for me to recover from the chaos. Not to mention that we had to take my Hoosier out so we could put in countertops and cupboards where the Hoosier used to sit. The Hoosier held all of my baking stuff and it's been a nightmare trying to hunt down just basic ingredients. Gratefully, we put stuff back in the new cupboards, so I can get started on baking again. But it won't be the same without my Hoosier. 😥 sniff. 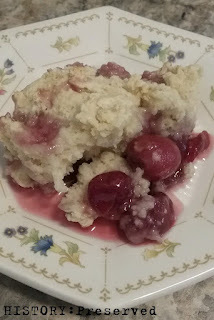 Anyway, because it's cherry season, I knew I had to at least make this Cherry Cobbler! Cherry Cobbler is all about the dough on top of the fruit. I really like this recipe for it. The dough turned out fluffy (they key is to not over mix it!) and nicely salty which was a good counterbalance to the sweet cherries. The Cherry Cobbler didn't hang around for very long. Always a good sign! I'm hoping to fit in an entire ration meal sometime this week, so stay tuned! That’s looks delicious! I’m glad everyone enjoyed it. You’ll have to try those cream of wheat rolls some time, that sounds really intriguing. Crickets... and a Museum Trip!